When selling a premium product especially in a competitive industry such as the automotive industry creating the WOW factor and differentiating your product from the competition is essential, digital signage both broadcast & interactive can help achieve these goals and communicate effectively to the customer as to why they should make this purchase from you. Purchasing a car is for most people likely to be the second biggest purchase they make behind a property so creating the buzz and excitement around the latest model, around the ground breaking features your vehicle offers goes a long way to enticing people your way. Broadcast digital signage enables you to show visually immersive graphics that will entice whilst also allowing you to broadcast more than one message in the same space making it a far more powerful communication tool. In a busy world people want information fast and no more so when selecting a vehicle. 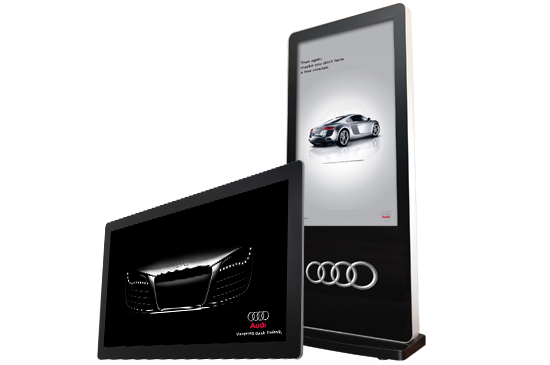 Rather than looking through a brochure and selecting the various options available interactive digital signage puts the customer in control and enables them to both visually see how these options will affect their vehicle whilst also providing them with far more detailed information which can be reviewed in a quick and efficient way by the customer. Customers regularly have wait times when in an auto dealer, either once completing paperwork or whilst waiting for a service on the vehicle. This can be improved both adding digital signage in strategic locations and providing informative and entertaining information such as news, traffic and weather whilst also broadcasting your sales messages. Inform with impact through the use of dynamic and visually immersive content to entice the customer and sell the WOW factor your brand offers. Build brand loyalty through the use of interactive displays allowing you to share your vision and brand values in a far deeper way than any non-digital solution can deliver. Engage customers and improve their experience when in your showroom by allowing them to search & customize the vehicle at the touch of a button utilizing our interactive signage solutions. We can offer you a solution for ALL areas of your auto dealership… from Outside on the forecourt to inside the showroom and everything in between!